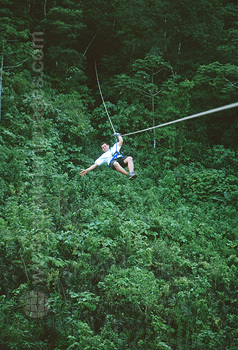 Want to experience Costa Rica’s incredibly colourful capital city? Then take a Spanish course in San José and discover colonial grandeur, exceptionally friendly locals and an astonishingly rich culture! Take a walk through San José’s maze of animated streets and alleys, where you will stumble upon countless museums and art galleries and delve deep into Costa Rican culture. If you want a break from the hustle and bustle of the city, do not fear! 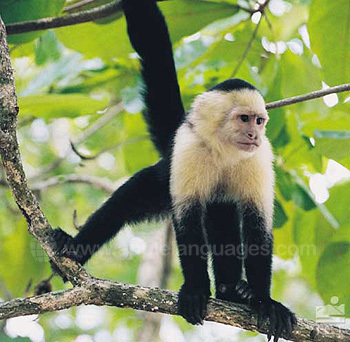 You’re never far from nature in Costa Rica, with dense rainforests, soaring mountain peaks and all manner of wildlife right at your fingertips. 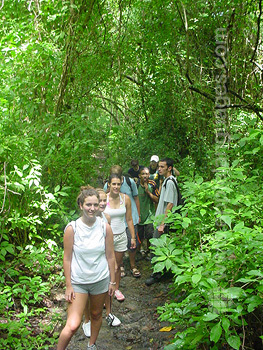 Study Spanish at our San José school for a truly unforgettable trip, and complete immersion in the Costa Rican way of life. Our San José school is situated in San Pedro, a safe area just ten minutes away from the very heart of the city. Also San José’s university district, you will find many bars, restaurants, shops and live-music venues within easy reach. It is the ideal location for language students, where you will never run out of friendly, open people to meet, or opportunities to put your Spanish skills into practice in real-life situations! The modern school building is purpose-built for teaching languages, and is comprised of 15 comfortable classrooms (indoor and outdoor), a computer room, and an outdoor snack bar. 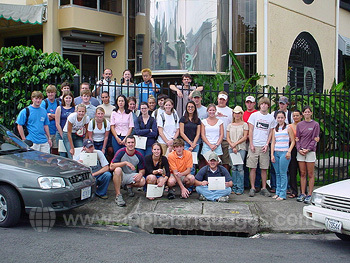 Our school in San José offers an Intensive Spanish course consisting of 20 group Spanish lessons per week, which take place on a Monday to Friday basis, either in the mornings (from 9:00am until 1:00pm) or in the afternoons (from 2:00pm until 6:00pm). Language groups are kept small, with an average of 4-6 students in each group (maximum. 8). This approach ensures that you get plenty of personal attention from teaching staff, improves confidence during class discussions and in turn allows your Spanish skills to progress rapidly! For even more individual time with teachers, the school also offers a course of 20 Private Lessons per week, or you can even combine the benefits of both approaches with our Combined Course. This option gives you 20 group lessons and 10 Private Lessons each week. 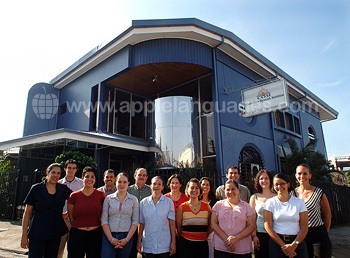 As in all of our schools, teaching is given by fully-qualified, native Spanish-speakers. A great way to help the local community, and practice your Spanish as well, is through volunteer work. 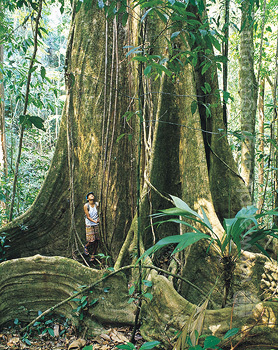 Our school arranges participation in various projects, including rain forest conservation and childcare. Don’t hesitate to contact us for more information. 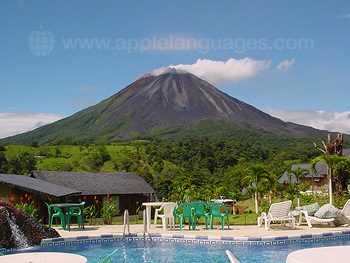 Stay with a Costa Rican host family for even more Spanish practice, where you will enjoy two meals each day and experience the famous Costa Rican hospitality! 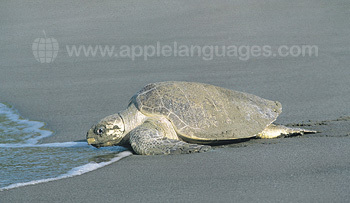 Alternatively, you might prefer to have your own space whilst you learn Spanish in San José. Our school’s three-bedroom apartments are located very close to the school, and have free Internet access, cable TV and a cleaning service. Choose to share your fully-furnished apartment with your fellow students, or keep the place to yourself. Lessons in Merengue, Salsa and Costa Rican cookery, movie-nights, museum visits, city tours, shows at the National Theatre, zip-lining, market visits, hiking trips, white-water rafting, and many more! Upon your arrival at San José Airport, representatives of our school will collect you and take you directly to your accommodation, free of charge. Average score for our school in San José based on 7 previous client reviews. 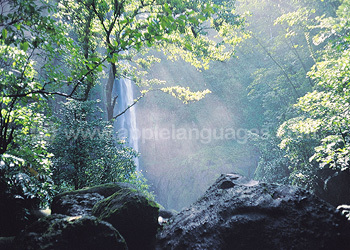 I found it a very pleasant experience and my Spanish has improved as a result. My stay in San Pedro Costa Rica in a Cuban family was very cozy and nice. My teacher was very nice and taught me a lot of Spanish grammar. 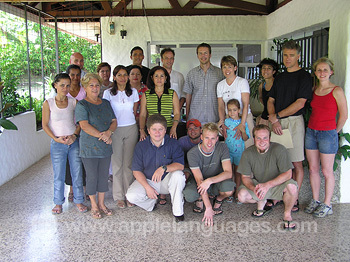 Thank you very much team [Spanish school in] Costa Rica. The instructor was very good and engaging. The course material was understandable and the classroom and homework assignments were helpful in my learning of Spanish. For the most part very good. Good food, private bath and a private room. Very friendly host. My only problem was with a not so great bed, but I slept OK. I enjoyed the class and have scheduled another in Peru next month. The course was fast paced and packed with learning. I wished there had been more homework or other ways to enrich my experience as I wanted to learn as much as possible. However, I am really pleased with the professionalism and help that the teachers provided to me. I enjoyed my trip and will definitely consider returning next year. I stayed in a hotel that was described as a 20 minute walk from the school. That was accurate for the walk to school but the walk back could be difficult at times as it was all uphill and it rains a lot in Costa Rica. The price was fair and the room itself was beautiful, spacious and clean. I had an amazing experience. EVERYONE was nice, welcoming and very encouraging about my Spanish skills. It was the best experience I could have asked for; I cried when it was my last day I loved it so much! I cannot stress enough that the people, the school and the general public make you feel at home and motivate you to learn about more about the culture and language. Thank you so much for helping me set this up, it was the best month of my life. The teacher was amazing, we went beyond basica grammar, we discussed many topics such as society, religion,and had differnet ways of learning, with different activites. It was great, we lived in an apartment that was part of a small gated group of apartment buildings wiht a security guard round the clock. Having already taken Spanish classes in the US for about 6 years, it was a great time for me to brush up on some grammar and vocabulary. We also did a lot of conversational exercises. This is an excellent school with mostly a 1 to 2 ratio of teacher and students. The school has an exellent staff. The apartment was comfortable for the duration of the stay. I was very satisfied with the course overall, I really enjoyed it. I made really good progress with my written and spoken Spanish and got a good insight into Latin American life and culture. I was satisfied with my accommodation also. The host family I stayed with were really friendly and made me feel very welcome. Staying with them enabled me to make really good progress with my oral Spanish and also to understand the Latin American lifestyle. I would recommend one of these courses to a person who wants to develop fluency in a language fairly quickly. 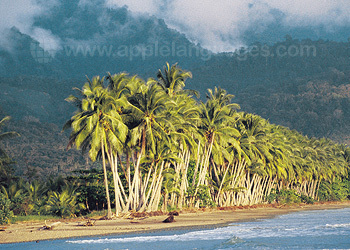 Costa Rica has beautiful beaches!